With many thanks to the other entrants, the winner of Caption Contest 61 (and the right to choose either one item or a caricature of their head to be included in HeroMachine 3) is ... Loki! Sick, but funny. I am still laughing at it which is, frankly, a little disturbing in its own right. Bixlord: And after getting into the van, there was neither candy nor puppies. song_bird2103: Mommy wasn’t kissing Santa Clause, last night. I think we -both- know that, don’t we? remy: Yeah, that’s him! That’s the man I saw naked in the phone booth! TopHat: I put it to you,that you are not ’super’ and instead just ‘really great’. Niall Mor: Look, Mommy! 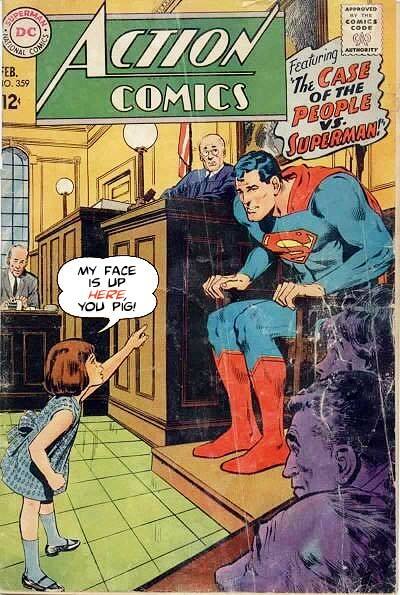 Superman’s gonna hurl! Thanks for entering, everyone! I'll post the new contest in a bit, though I do want Loki and the others to have their moment in the sun, so it won't be TOO soon. I still think remy’s was the best, but I can appreciate your choice. And I’d hate to run these myself. Well done Loki and everyone else. Cool I got an honorable mention! Congrats to Loki! Thank you everyone, and Jeff, I’d like a Wizard-like staff, with ruins carved into it, if you would? You got it, Loki. Thanks!